The debate over the role of the humanities in higher education and American life reached new fervor this summer with the publication of several high profile reports and articles. A June 6 article in the Wall Street Journal, citing data from the Harvard Humanities Project, claimed the percentage of humanities degrees (as a share of all undergraduate degrees attained) has dropped by half since the 1960s. A few weeks later, the American Academy of Arts and Sciences released The Heart of the Matter: The Humanities and Social Sciences for a vibrant, competitive, and secure nation, a report emphasizing the importance of the humanities in American life and calling for increased public funding for these fields, among other recommendations. These publications prompted a flurry of responses from across academia and beyond, asserting counter claims and offering additional data that complicate the picture. Most agree that the original assertion of the Journal article is, technically, correct—the percentage of degrees awarded in humanities majors, as a share of all degrees, has dropped by nearly half since 1967. Data sets that go back to the 1940s, however, show the 1960s to be a period of unusually high enrollment, and the long-term trend has been a much smaller decline in the percentage of humanities majors. New York Times columnist Nate Silver has also noted that, using the measurement cited in the Journal article—share of all degrees post-1970— mathematics and engineering majors have also declined. Silver and others have demonstrated that while all of these majors have declined as a percentage of degrees awarded, the percentage of all college-age Americans holding these degrees has actually increased—a discrepancy caused by the boom in college attendance after 1970 and the rise of new occupation-oriented degrees. It's also worth noting that even if the share of humanities majors has declined slightly, humanities courses continue to be some of the most commonly required courses for all college students, and employers have shown demand for the sorts of writing and thinking skills cultivated through study of these disciplines. The percentage of students completing humanities majors is lower today than in the late 1960s. 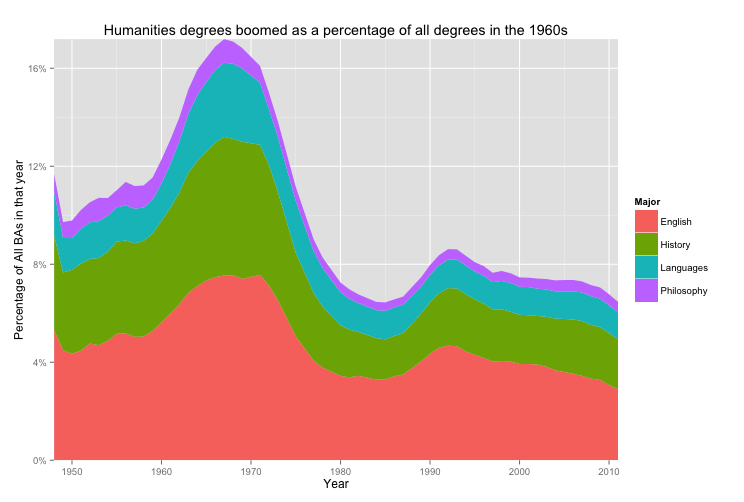 Earlier data, however, show that the high enrollments of the late 1960s were an aberration—through the 1940s and 50s, the humanities accounted for about 10 percent of undergraduate degrees. Enrollments peaked in the late 1960s before dropping off sharply in the 1970s. Current data also indicate that the percentage of humanities degrees increased through the 1980s and 90s and declined only slightly in the 2000s—National Science Foundation data show the figure rising to 8 percent in 2007, while the National Center for Education Statistics recorded 12 percent for 2007 (humanities enrollments dropped again slightly during the Great Recession). Furthermore, while the humanities have decreased as a percentage of all degrees, there has been an increase in the percentage of all Americans with humanities degrees—as Ben Schmidt points out, the percentage of college-age Americans holding degrees in the humanities has increased fairly steadily over the last half-century, from a little over 1 percent in 1950 to about 2.5 percent today. Nate Silver has noted that the same pattern applies not only to the humanities, but also to many social science and STEM fields. Between 1971 and 2011, the percentages of degree in mathematics, engineering, and history all declined as shares of all college degrees even as the percentage of college-age students earning these degrees increased—a phenomenon Silver attributes to rising enrollments in occupational fields such as health and criminal justice that had not previously offered or required college degrees. While only a small percentage of students complete humanities majors, the majority of students take coursework in these disciplines. AAC&U surveys have found that among the institutions that have common learning outcomes for all students, 92 percent require coursework in the humanities. The single most common course taken by all students is freshmen composition—US Department of Education data shows that 83 percent of students who graduated high school in 1992 and went on to earn a bachelor's degree took at least one composition course. Students from this cohort were also likely to take courses in US history (44 percent), US government (35 percent), and literature (29 percent). Many of the learning outcomes required by colleges—and requested by employers—are cultivated through study of the humanities. Among institutions with common learning outcomes AAC&U surveyed, 99 percent require courses that focus on writing skills, 95 percent require courses that develop critical thinking skills, and 79 percent require courses that develop intercultural skills. More than 83 percent of college students take composition, and more than a third of all students take US history and government. The percentage of US population as a whole with degrees in the humanities has risen steadily since the 1950s. Ninety-three percent of employers agree that "a [job] candidate's demonstrated capacity to think critically, communicate clearly, and solve complex problems is more important than their undergraduate major." This article cites data published by the National Center for Education Statistics, the National Science Foundation, the Humanities Indicator Project, The Wall Street Journal, the New York Times, and AAC&U's public opinion research.